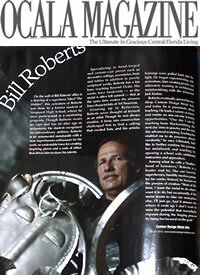 Bill Roberts - Ornamental Metalsmith and his artwork have been featured in selected magazines, including This Old House, The Crafts Report, Ocala Style Magazine, Ocala Magazine and the Metal Artist Forum - MAF Newsletter, among others. Please visit the links below to read the articles. Ocala Magazine: Feature article, Homework. Bill Roberts, Ornamental Metalsmith.